1. Yuyudhana ( युयुधान ), better known as Satyaki ( सात्यकी ), was a powerful warrior belonging to the Vrishni clan of the Yadavas, to which Krishna also belonged. He was the son of Satyak (सत्याक) and grandson of Sini (सिनी), and was the cousin of Krishna and student of Arjun. 2. Satyaki was one of the 7 Atirath(The Best Warriors) of Narayani Sena, other Atiratha were Lord Krishna, Lord Balrama, Lord Krishna's Son Samba. 3. 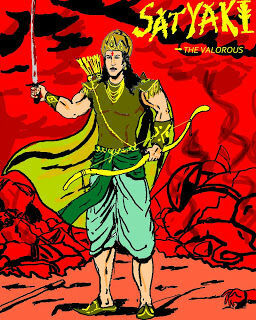 He was regarded as one of the Best Warrior in the Mahabharat War, Arjuna called him his equal. 4. Satyaki was devoted to Krishna and was student of Arjuna as well as co-student under Dronacharya. 5. Satyaki was a valiant warrior and on one particular occasion, Drona was stunned when Satyaki broke his bow for 101 times successively. 6. He is also known as the unconquerable Satyaki. 7. On the day of Jayadratha's killing, Shri Krishna gave Satyaki his personal chariot of the Garuda banner. On that day, nobody including Drona & Karna were able to resist Satyaki. 8. He also had the opportunity to slay Karna but he did not take that to protect Arjuna's vow of slaying Karna. 9. Satyaki is also noted as an ayurvedic physician who was an expert in Shalya (surgery) and Shalakya (Eye and E.N.T.). 1. Satyaki strongly and passionately favored the cause of the Pandavas over the Kauravas in the Kurukshetra War. 2. Satyaki accompanied Krishna to the Kuru capital, with Krishna as the emissary of peace which was ridiculed and turned down by Duryodhana. 3. When Duryodhana started shouting at Lord Krishna, Satyaki took out his Dagger and threatened to Kill Duryodhana, he was stopped by Lord Krishna. 1. Satyaki had decided that he will fight for the side that has Lord Krishna. 2. So when Duryodhana and Arjuna went to Lord Krishna to decide on who gets Krishna, Satyaki stood outside the room of Lord Krishna. 3. Duryodhana chose part of Narayani Sena led by Kritvarma, while Arjuna chose Lord Krishna. 4. When Duryodhana had left, Krishna laughed and asked Arjuna, "what use I could be of in a war? I shall not wield any weapon." Arjuna had an equally hearty laugh. He said, "When you are with us who can think about victory or defeat." You have been our guide throughout. In the war also you shall guide us. You may be my charioteer and my name shall become immortal as you will be called Partha Sarthi. 5. Krishna has decided to act as the charioteer of Arjuna during the war. He came out of his chamber with Arjuna. 6. Satyaki was waiting there anxiously. 7. He felt relieved when he was told that Krishna would be on the Pandavas side. 8. He informed Arjuna and Krishna that Duryodhana had just met Balarama. 9. Satyaki was afraid that Balarama might win over by Duryodhana as he was his favorite pupil. But Krishna allayed his fears. Krishna said that Balarama had asked his opinion. When he told that he wanted to be on the side of the Pandavas. Balarama said that he would not join the war. 10. If Krishna is on the Pandavas's side then victory of the Pandavas is certain. Balarama had lot of affection for Duryodhana, who had all the qualities of a Kshatriya prince. His only weakness was his envy against his cousins, the Pandavas. Balarama said that when Krishna decided to join the Pandavas Duryodhana fate was sealed. 11. After knowing this, Satyaki conveyed his decision to fight for Pandavas as Lord Krishna was on their side. 12. After these discussions they sped towards Upalavya where Yudhisthira was eagerly waiting for the result of Arjuna's embassy to Dwaraka. 1. Satyaki is also noted as an ayurvedic physician who was an expert in Shalya (surgery) and Shalakya (Eye and E.N.T.). 2. He is mentioned by Dalhana in Timir and Annantvat(sushrut Uttartantra) as Ayurveda Expert. 3. He is mentioned as an Eye Specialist by Chakrapani in Netraroga (Charak in 300 B.C. ). 1. Satyaki was a skilled warrior and great bowman. 2. In Kurukshetra war, Satyaki broke the bow of Dronacharya 108 times. 3. He killed warriors like Bhoorishravas, King Salwa (शाल्व), Somdatta, Chitrasen (चित्रसेन), Jalasandh (जलासंध) and many others. 4. His ten sons were killed in the war. 5. He was one of the 10 great Warrior survivors of the war. 1. In the course of the fourteenth day of the conflict, Satyaki fights an intense battle with archrival Bhurisravas with whom he has a long standing family feud. 2. After a long and bloody battle, Satyaki had to fight many warriors at once and he begins to tire, and Bhurisravas batters him and drags him across the battlefield. 3. Arjuna is warned by Lord Krishna of what is happening. 4. Bhurisravas and his warriors prepares to kill Satyaki, but Arjuna, shoots an arrow cutting off Bhurisravas' arm. 5. Bhurisrava wails out that by striking him without warning, Arjuna had disgraced the honor between warriors. 6. Arjuna rebukes him for attacking a defenseless Satyaki. 7. He reiterates that protecting Satyaki's life at all costs was his responsibility as a friend and comrade in arms. 8. Satyaki then emerges from his swoon, and swiftly decapitates his enemy. 1. After the infighting between Yadavas and subsequent submergence of Dwarka, Arjuna took with him Satyaki's Grandson and helped him create his own Kingdom Near Saraswati river. 2. Asanga was son of Satyaki and Yugandhara was his grandson. 3. Yugandhara became the ruler of the territory near the Sarasvati River. 4. 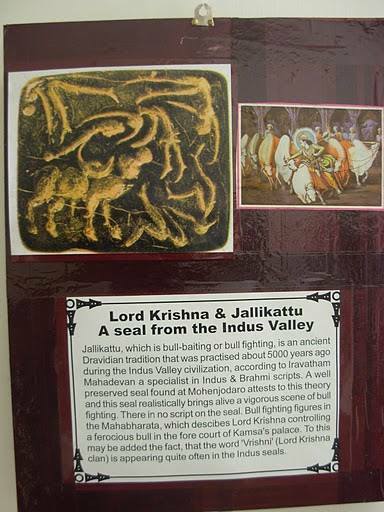 This Kingdom can be thought to be the only reference ever that can be called as the forefathers of Indus Valley Civilization. I enjoyed reading this information about Satyaki. Will you answer my question if I ask since you seem at ease with the Mahabharat?